Rinse salmon and pat dry with paper towel. Season on both sides with salt & Pepper. Heat 1 T olive oil in nonstick pan over medium heat. Sear until browned on outside and slightly opaque - about 5 minutes per side. Meanwhile, wash tomatoes, cilantro and scallions. Halve tomatoes and finely chop cilantro and scallions. Peel red onion and mince. Juice 1 1/2 limes into a large bowl. Add tomatoes, cilantro, scallions, onion, 1 T. olive oil and vinegar. Toss to combine. Stir in cooked quinoa. Taste and add s&p as needed. Divide evenly into bowls. Half avocado. Scoop out flesh and cut into thin slices. Squeeze over remaining half lime. Flake salmon with a fork. 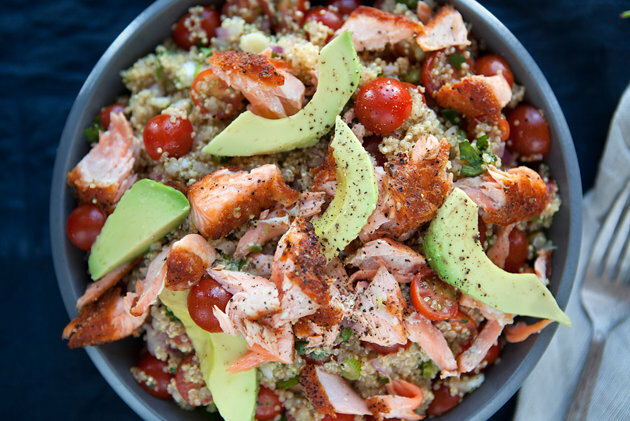 Top with avocado and salmon and serve. Say "No" to Genetically Engineered Fish! The Best French Onion Dip Ever!